In the world of exercise bikes, DKN have build themselves a reputation for premium quality kit with innovative features (such as tablet app control in their latest i-series machines). Traditionally, they’ve stuck to manual control exercise bikes at the more budget price points, so we were very surprised when we learnt about the launch of the AM-E exercise bike: a budget, computer controlled DKN bike, surely not? First the assembly: It’s pretty straightforward and not unlike their others models (about 30 mins), but we were keeping an eye to see if the parts fitted together well and to gauge the build quality. We were pleased to see that the usual DKN build quality hadn’t been compromised in making budget priced bike! Once assembled, we used the leg level adjustment facility on the back to ensure that it was completely flat. The knobs to make adjustments are on the top of the rear feet of the bike, making it very easy to make adjustments and it has made us wonder more manufacturers (including DKN on other models) don’t do this! Finding the perfect riding position is also straightforward as the seat can be adjusted for both height and reach and the handlebars are also adjustable. Once built, the black and silver designcan be appreciated. This is one nice looking, compact machine! So, most importantly, what’s it like to use? As well as smoothness, one of the things that we normally seek in a good exercise bike is the range of resistance levels on offer. The AM-E offers 32 levels of friction free, computer controlled magnetic resistance and your out of breath reviewer can confirm that the higher levels are VERY hard indeed! The console design is a familiar one, the basic design of which we first saw a few years back on a different DKN machine, and it’s since been adopted by a number of other fitness equipment manufacturers. At its centre there is a large, 2 colour, back-lit LCD display that is clearly organised to display information. In addition there are 4 user profiles so you can enter the personal information of up to four people for increased accuracy of training data feedback, which is mightily impressive for an exercise bike at this price point! In terms of programs, there is a good degree choice. In addition to the manual mode (which can be used for a target distance, calories, or time), there are 12 pre-set programs. The AM-E follows the precedent set by other DKN exercise bike consoles and has the profiles of programs printed right on the console, which make selection very straightforward. The console will accommodate those looking to setup a completely bespoke program through its user profile functionality and we’re very pleased to see a heart rate control program in the selection. Now, this is where the AM-E breaks with its competition: quite a number of similarly priced exercise bikes offer heart rate control functionality in their consoles, but rely on pulse grip sensors for heart rate measurement, the rendering the whole thing a pointless exercise. The AM-E on the other hand, has a Polar compatible wireless heart rate receiver built into the console, which can be used with any compatible chest strap for the console to receive ECG accurate heart rate measurements and coupled with the heart rate control program, the resistance of the bike is automatically adjusted to keep you in your desired heart rate range throughout an exercise session. Despite its small footprint, the AM-E is a physically heavy bike, weighing in around 30kg and the weight of the product itself will certainly be one of the main factors behind the bike feels so sturdy when being used. Thoughtfully, DKN have built in transport wheels at the front and the bike can be moved around when not in use relatively easily by being tilted onto the wheels at the front. Should anything go wrong, the warranty on the AM-E is reassuringly long with a comprehensive 2 years parts and labour cover. To get the DKN AM-E exercise bike for only £219.00, enter voucher code AM-E on DKN basket page! 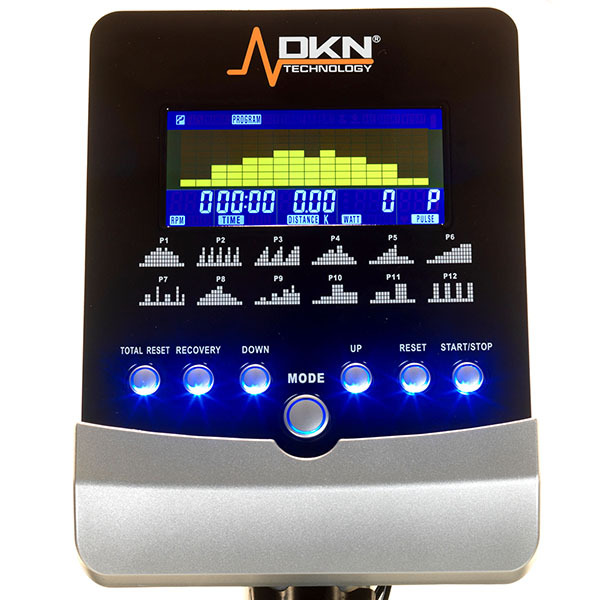 Yes, we were sceptical about whether the typically impressive DKN quality could be achieved at this price point, but our tests showed that DKN have indeed made another gem of an exercise bike: Smooth, great range of resistance, easy to use console with a wireless heart rate receiver and heart rate control and 4 user profiles too! At this price, it's a case of 'Do you have stock & how fast can you get it to me?"